The Meaco 300i Swimming Pool Dehumidifier is a purpose designed unit configured for wall-mounting and constructed to resist the high humidity and potentially damaging chemicals that are encountered in this environment. This unit includes options for heating the air passed through the dehumidifier, for through wall mounting and a remote, wireless humidistat, all at additional cost. Prospective purchasers of this dehumidifier should not that Meaco will provide advice regarding the suitability of this dehumidifier for specific pools on receipt of specific details of the surface area of the water, the water temperature, the air temperature and whether a cover is used. As an indicative guide if the air temperature is 2°C higher than the water temperature and a cover is used the Meaco 300i is suitable for a pool with a surface area of up to 43m2. The high build-standards which apply to swimming pool dehumidifiers to enable them to cope with the special demands of this application also make the 300i suitable for other commercial operators in locations where extremes of humidity are encountered and for whom a high quality, wall-mounted dehumidifier is the preferred option. Because of the particular environment for which this unit was designed it is not suitable for use in areas where the ambient temperature is below 15°C. The Meaco 300i Swimming Pool Dehumidifier will remove 54 Litres of moisture per day from air at a temperature of 30°C and relative humidity of 80%. Although both temperature and relative humidity will affect the actual rate of water collection these conditions are not very far removed from those found in many swimming pools and in practice the rate should not be significantly different from the stated figure. Other commercial users should note that the actual extraction rate achieved by this unit in cooler and, possibly, less humid areas will be significantly lower. This dehumidifier is not suitable for low temperature operation. It was designed for warm, indoor swimming pools and will not be effective at temperatures below 15°C. The Meaco 300i does not collect water in a reservoir but is configured for continuous drainage. Drainage is gravity fed and for a wall mounted unit in an application where drainage outlets should be plentiful this system is entirely adequate. Commercial operators seeking a dehumidifier for applications where a convenient drainage outlet is not available will require a separate condensate pump to force the water over a greater horizontal distance or to provide vertical lift. An adjustable humidistat is incorporated in the dehumidifier with which the preferred level of relative humidity may be programmed. Provided the 300i is operating within its defined limits it will maintain that level of relative humidity without further intervention. A remote, radio humidistat is included in the purchase price and a more sophisticated version, with a digital read-out, is available at an extra cost. In the event of an interruption of the power supply the Meaco 300i will return to operation when the power is restored as it incorporates an auto-restart feature. The Meaco 300i Swimming Pool Dehumidifier can not only control humidity in the pool area but may also be configured to heat the pool enclosure. It does this using an optional extra called Low Pressure Hot Water (LPHW) heating. This allows the operator to connect the dehumidifier to a boiler and the air can be heated via a hot water pipe that passes through the dehumidifier. The LPHW heating system produces an output of 2kW and in combination with the heating effect of the dehumidifier the output is 2.9Kw. The LPHW capability is an optional enhancement for which an additional charge is made. The Meaco 300i is a relatively light-weight dehumidifier at only 40Kg and should not present any unusual installation difficulties. It is also compact with dimensions of 65.3 x 78.0 x 25.5cm and will be relatively unobtrusive if mounted on the interior wall of the pool enclosure. 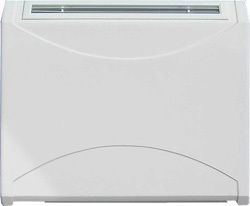 The unit may also be floor-mounted if preferred and a mounting stand is available if required. If it is more convenient and/or aesthetically pleasing to install the unit on the other side of the wall, out of sight of pool users, an optional through-wall mounting kit may be purchased. This employs neatly designed mountings on the upper and lower surfaces of the dehumidifier which will draw in and expel air through discreet grills, the only visible evidence of the unit within the pool area. In many respects the Meaco 300i is ideal for a small swimming pool and in no way more than its exceptionally low noise output of only 44dB. This would do credit to a small room dehumidifier for use in the home and is one of the outstanding features of this unit. Although dehumidifiers are always noisy this noise level should not be enough to interfere with the quiet relaxation of pool users. In summary this is a very suitable dehumidifier for a small pool and worthy of consideration by any pool operator or owner.